Can you survive against their superior strength and size? 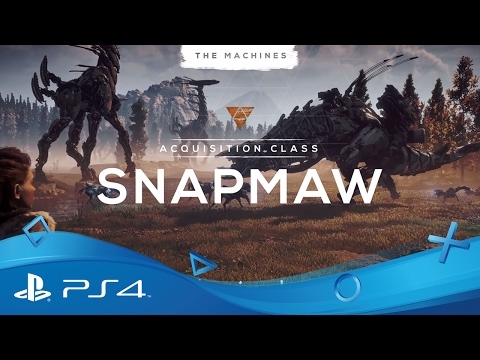 The world of Horizon Zero Dawn is inhabited by Machines of all shapes and sizes. Terrifyingly alien yet strikingly familiar, these mysterious automatons combine mechanical strength with organic features and an animalistic ferocity. 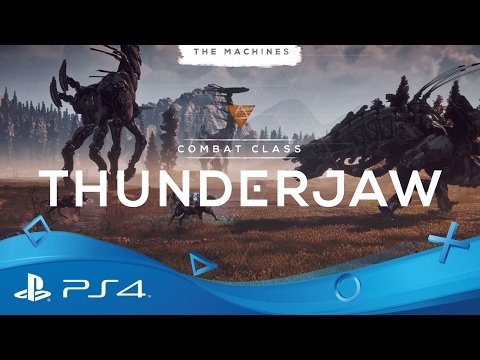 The combat-class Thunderjaw is one of the deadliest Machines in Horizon Zero Dawn. A formidable beast equipped with cannons, disc launchers and a mouth laser, its powerful ranged attacks will quickly cut down any hunter foolish enough to alert it. Space permitting, it can also unleash with a devastating range of melee attacks such as charges and tail swipes. 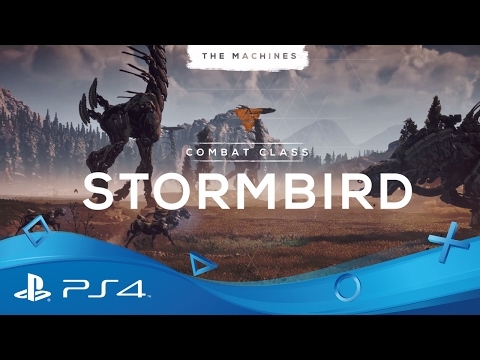 Soaring through the sky at high altitude, the fearsome Stormbird is a combat-class machine that can swoop down and attack its prey with tremendous force. It’s just as dangerous on land as it is in the air, with a variety of swift and powerful attacks that range from wing blasts to claw slashes. Its enormous metal wings are also capable of collecting and discharging the electricity in the air. An acquisition-class Machine, the Snapmaw is frequently found basking in or near bodies of water, where it gathers valuable minerals from the sediment. It can move with surprising ferocity when alerted, lashing out with an array of melee attacks that include powerful lunge bites and tail swipes. For ranged attacks, it fires off cryo mortars that freeze the target on impact. The Behemoth is a huge, rugged transport-class machine that uses anti-gravity technology to transfer precious cargo from smaller acquisition-class machines into its stomach container. When provoked, it may charge at the enemy or use its anti-gravity unit to hurl heavy objects. It is also equipped with a set of grinding drills that allow it to pulverise and propel rock projectiles. The Machines were all made for different purposes and all work together towards a common goal. Together they form their own ecosystem and they need each other to survive. For example, the acquisition Machines’ purpose is to gather natural resources for fuel. They are often accompanied by reconnaissance Machines, which patrol the area looking for potential threats. And transport Machines carry the resources gathered by acquisition Machines between areas following convoy routes. Making use of ancient technologies, Aloy gains the ability to override the systems of certain Machines and turn them into powerful allies or gain valuable information. By exploring the world and completing Cauldrons, you’ll learn to override even more Machines. But be careful – with the exception of the mountable Machines, the override effects are temporary. So make sure you use your new companions to maximum effect before the time runs out. Scanning Machines with your Focus device reveals their components and valuable weak points, so knock off their armour plates to expose these delicate sections and take advantage for maximum damage. Don’t forget to pick up any removed components, as they can be used against your foes, while others are more useful as crafting resources.